I have an amazing video to share with you today. As Bob Proctor says in the film The Tapping Solution "People are starting to understand themselves as an energy field. And the fact that they can work with it to get the results they want." And these experts aren't just saying they support EFT, they're saying that they use it on a regular basis and have had results with it. 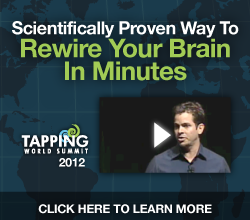 This video goes deep into a technique that has been scientifically proven to change the brain, literally re-wiring it, to both eliminate unwanted negative traits, emotions and beliefs and enhance positive ones. And that’s that people have similar patterns and that the #1 thing that all people want, and that I know you want, is to be emotionally fulfilled. Think about it for a second…if you want to be healthier and lose weight it’s because of how it will make you feel. After all, wouldn’t you feel better if you were healthier. Wouldn’t you feel more confident? And if you want to be more financially successful, isn’t it really because of how you would feel being able to do whatever you wanted with financial freedom? Wouldn’t you feel better if you had the choice to be able to travel, have a nicer home and nicer car and to be able to contribute more financially in helping others? I could ask questions like this about your life on a number of different areas and I know I’d get the same response…we as humans do things to make us feel better and to be more emotionally fulfilled. So the important question is…how do you get to have more of what you want and have more emotional fulfillment? The video on the page will show you how.